Long before the Grammy nominations, sold-out performances at Carnegie Hall, and Hollywood friends and lovers, Ryan Adams fronted a Raleigh, North Carolina, outfit called Whiskeytown. Lumped into the burgeoning alt-country movement, the band soon landed a major label deal and recorded an instant classic: Strangers Almanac. That's when tour manager Thomas O'Keefe met the young musician. For the next three years, Thomas was at Ryan's side: on the tour bus, in the hotels, backstage at the venues. Whiskeytown built a reputation for being, as the Detroit Free Press put it, "half band, half soap opera," and Thomas discovered that young Ryan was equal parts songwriting prodigy and drunken buffoon. Ninety percent of the time, Thomas could talk Ryan into doing the right thing. Five percent of the time, he could cover up whatever idiotic thing Ryan had done. But the final five percent? Whiskeytown was screwed. Twenty-plus years later, accounts of Ryan's legendary antics are still passed around in music circles. But only three people on the planet witnessed every Whiskeytown show from the release of Strangers Almanac to the band's eventual breakup: Ryan, fiddle player Caitlin Cary, and Thomas O'Keefe. Packed with behind-the-scenes road stories, and, yes, tales of rock star debauchery, Waiting to Derail provides a firsthand glimpse into Ryan Adams at the most meaningful and mythical stage of his career. Thomas O'Keefe was the tour manager for Ryan Adams and Whiskeytown from 1997 until their breakup in 2000; he is currently the tour manager for Weezer. His twenty-plus year career in the music business includes twelve years with Grammy winners Train and shorter stints with acts as diverse as D Generation, Sia, Third Eye Blind, and Mandy Moore. He was also the bass player for North Carolina punk band ANTiSEEN, recording thirty-eight releases and playing concerts across the United States and Europe. O'Keefe lives in Nashville, Tennessee. Joe Oestreich is the author of three books of creative nonfiction: Partisans, Lines of Scrimmage (cowritten with Scott Pleasant), and Hitless Wonder. His work has appeared in Esquire, Creative Nonfiction, River Teeth, Fourth Genre, The Normal School, and many other magazines and journals. Four of his pieces have been cited as notable essays in the Best American series, and he's received special mention twice in the Pushcart Prize anthology. He teaches creative writing at Coastal Carolina University. Oestreich lives in Myrtle Beach, South Carolina. 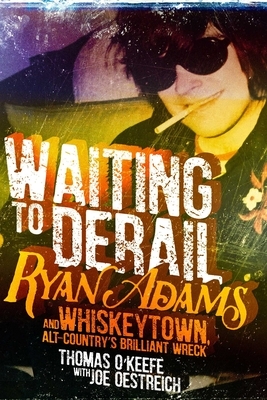 "Waiting to Derail is a hard book to put down—especially if you love Ryan Adams. Thomas O’Keefe takes the reader inside the van and the venues to give us an entertaining collection of stories from Ryan's days in Whiskeytown." "Waiting to Derail is a book that is wholly original, frenetic, and nearly impossible to put down."